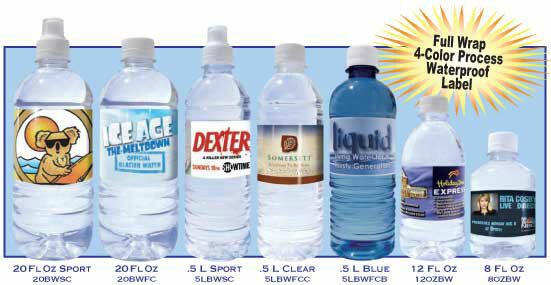 Featuring Full-Wrap 4-Color Process Waterproof Labels!!! CLICK HERE TO SEE OUR ELITE BOTTLE! Prices effective January 1st, 2007. Please call for larger quantities or other sizes. Set up charge $95.00 (v). Includes 4 color process. FOB our East Coast or West Coast facilities. California orders add CRV Tax .05 each bottle. Spring Water is available as well. Must specify, add .05¢(R) each.